This poster was long The Big Mystery to us. 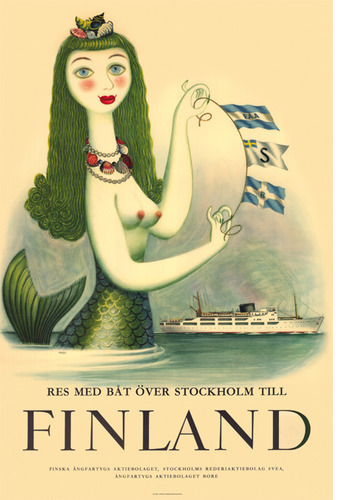 The little sensual mermaid wants us to travel from Stockholm to Helsinki (and vice versa, too). For many years we tried to figure out who the artist behind the ABBE signature was. We tried everything, we called up old-timers in the business, contacted museums, scanned the Internet. 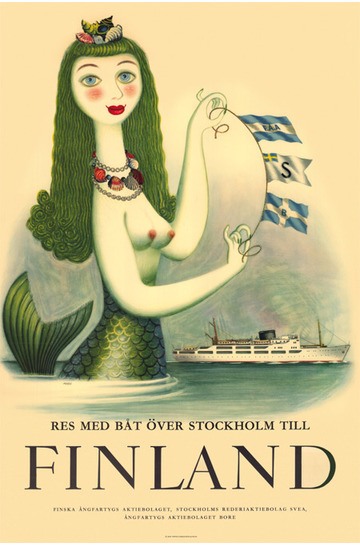 We only figured out the name of the ad agency in Stockholm where the poster was produced. The agency is long gone and nobody could remember how the poster came to be and who ABBE was. 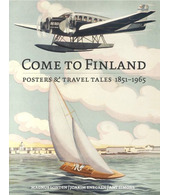 Thanks to poster gurus in Finland and around the world we learned it was created for the Finnish Olympic year, 1952. Then, in 2008, there was a breakthrough. Or at least a step forward. From the Swedish National Library we received word that the artist’s name must be Albert Andersson. There the trace stopped. But the poster hunters never give up! Then one day we received a mail. The writer said she is the artists daughter!! What a celebration! So now we know the artist is the Swedish poster artist Albert Andersson.